The holidays are upon us! ‘Tis a time for opening our hearts and unfortunately our wallets too! But just because your bank account might not be filled with gold (or frankincense or myrrh) doesn’t mean you can’t decorate your home for the season! Here are some creative and SIMPLE, again, SIMPLE ways people have decorated their homes for the holidays. Just flip your tomato wire hanger upside-down, throw some lights on it and VOILA! You have yourself a minimalist Christmas tree! If there’s anything I have an abundance of during the time before Christmas, it’s bottle caps left over from Thanksgiving weekend. Heck, if it takes 3 to make a snowman ornament, I could probably hang one from every branch! So go ahead and open that extra Winter Stout, you have a snowman ornament that needs a head! This post started off as legitimate and simple ideas for decorating but like the crayon window, I felt compelled to point this one out. The bottle of lights! I’m no mixologist, but I’d say the ingredients for this concoction are 1 part wine bottle and 1 part Christmas lights. On second thought, it would be really cool if you had a plethora of wine bottles that were different shapes, sizes, and colors. One bottle looks kinda lonely, and nobody wants to be alone on the holidays. These ideas are all very simple and sometimes a little TOO simple, but the important thing is that you’re in the spirit and your heart is in the right place. As users of storage, most of our customers are better organizers and crafters than the average bear. 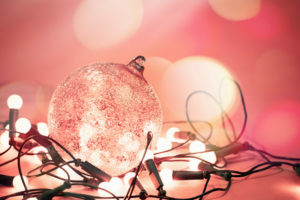 We would love to hear any ideas for simple, crafty ways you decorate for the holidays. E-mail us at customerservice@storexpress.com and share your ideas with us!